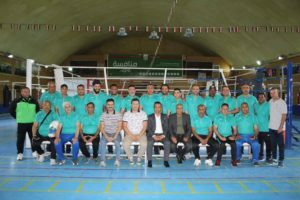 The Iraq Boxing Federation hosted an important AIBA 2-star Coach Course in their capital city in Baghdad in the recent days. Tunisia’s experienced coach and official Mr. Makrem Grami was the Instructor of the AIBA 2-star Coach Course in Iraq who worked in several previous development programs in the Arabic region. The previous AIBA 2-star Coach Course in our continent was hosted by Boxing Federation of India in the city of Rohtak last November just before the AIBA Women’s World Boxing Championships. Current certified and active AIBA 1-star Coaches, who have done an AIBA 1-Star Coach Certification Course and the corresponding certification course, were eligible to take part in the 2-star AIBA Coach Course in Baghdad. Altogether 26 coaches attended in the AIBA 2-star Coach Course in Iraq’s capital. Asia will be hosting the several of the upcoming AIBA events, five ASBC Asian Confederation Boxing Championships in 2019 and the Tokyo 2020 Olympic Games therefore the education is one of the most important topics for the Asian Boxing Confederation and the affiliated national federations.